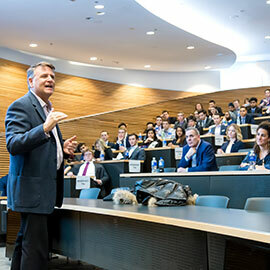 Former Dragons’ Den star and celebrity author of the Wealthy Barber series, David Chilton, gave a keynote address to conclude the first-year PepsiCo Pitch competition last weekend at the Lazaridis School of Business & Economics at Laurier. A graduate of the Lazaridis School, Chilton told first-year business students the story of his involvement in the multi-million-dollar Looneyspoons cookbook and healthy living conglomerate with sisters Janet and Greta Podleski. The tale ends with an investment by Chilton at the encouragement of his mother. “When your mom tells you to publish the book, you publish the book,” said Chilton as a lesson ‘they don’t teach you in business school’. Another lesson Chilton says is not taught in business school is to “be nice”. “Treat people kindly and fairly. Authenticity resonates with people. Be likeable, be trustworthy,” he advised. For more information, read the story on the 2017 PepsiCo Pitch results.